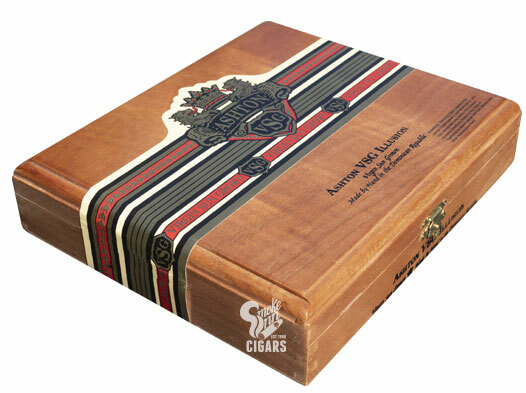 Ashton Virgin Sun Grown is best known by its nickname, Ashton VSG. The cigars are the product of the collaborative efforts of three of the cigar industry's biggest players: the Levin family (Ashton), the Fuente family, and the Oliva family. VSG takes its name from its dark and oily wrapper, which is a high-priming Sumatra-seed leaf that is sun-grown in Ecuador by the Oliva family. This leaf is then processed by the renowned Fuente family at their Tabacalera A. Fuente facility in the Dominican Republic and paired with the Fuente's own Dominican-grown leaves throughout the binder and filler (including four-to-five-year-aged leaves). The end result is a surprisingly rich, strong, and full-flavored smoking experience—one that helped usher in the modern trend of ultra-full-bodied profiles when the VSG first debuted in 1999. The cigars have racked up multiple accolades since their release, noted for delivering rich, full-bodied flavors of charred oak, baker's cocoa, espresso powder, molasses, leather, and burnt caramel.